Hello. It’s been a while. I have been neglecting my blog over the last six months – big time. To explain…firstly, I started a new job in April – one which I am loving but one which takes me from East to West London, and back, on a daily basis (oh, roll on Crossrail. So long Abellio Greater Anglia and your constant broken down trains), which combined with longer hours makes for not much time at home. Secondly, after the craziness in the house of last year and the feeling of constant building site, we have stepped back and taken a break. Thirdly, due to the second reason, we pretty much spent our initial house budget, so it was time to save, ready to start again. In that time, things in Forest Gate have gone kind of insane. The house prices have gone through the roof (turns out it’s a good time to remortgage…! ), open house viewings are apparently attracting over a 100 people a time (really???) and we made it into the coveted ‘Let’s Move to Forest Gate’ Guardian slot – which may have something to do with all of the aforementioned things. Also, to my surprise, we seem to have gone ‘Vintage’. Yes, you did hear me right. I lived through the vintage revolution in Stoke Newington, when it seemed every other shop was a Vintage or Retro clothes or furniture shop. Forest Gate’s not quite there yet…but Vintage Fairs ARE. 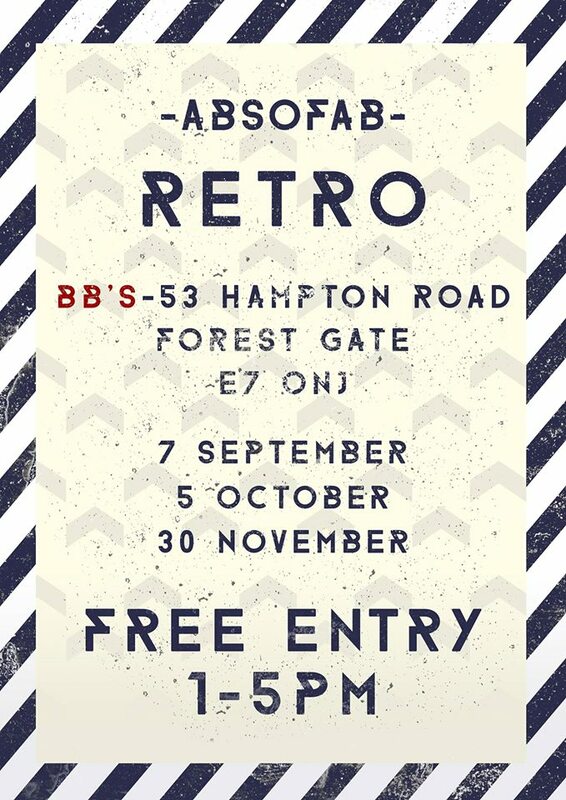 Last week – I trotted a few roads away to Hampton Road with my other half’s mum, to check out the first ‘Retro Sunday’ at BB’s. I wasn’t sure what to expect. My last local antique/jumble sale visit was to St Mark’s Church on Lorne Road last October, where it was 20p to get in and pretty much everything was around 10p. (As an aside, that was excellent. Picked up a set of short stubby french-style wine glasses at a bank-breaking 7 glasses for 70p. It almost felt mean to only pay that. A year later they are still serving us very well!) But, the mention of ‘Retro’ normally puts the prices up to pounds not pence. And yes, it was actually a real vintage fair. And a great one too! We keen bees turned up as it was opening and I headed straight to the clothes rails. I feel I’ve learnt a few things on vintage clothes recently when in my last job I worked on the book to go with Dawn O’Porter’s This Old Thing Channel 4 TV series (expertly compiled and edited by fellow Forest Gater @pixiecake). I’d always wanted to shop vintage, and had the occasional thing, but there hasn’t been much opportunity in this part of East London. Until now. The cardinal rule being, just try it on – I spied early on a fab, chess set dress – which was unlike anything I’d seen before. There were no sizes on anything but it looked about right so along with a cute tea dress I went into the loos with my shopping buddy who’d also picked something up, and with the help of a borrowed mirror tried on our finds. For £30 I have bagged something nice and unique, and from just down the road. Definitely a good Sunday. There were a lot of clothes, some home ware (though not as much as I would have liked) and vast amounts of buttons, jewellery and knitting patterns (we bought most of them). Tips for next time (there’s another one same place on 5th October): take more cash (No cards accepted). Be prepared to rummage (sure I missed stuff). Get there early (only two loos for trying things on!). Buy some cake (why didn’t we?). Thanks Absofabvintage for organising it. Apparently there was another evening event at The Wanstead Tap this week which I sadly missed.